He comes bearing gifts for a nation-Jai Ho! I thought they were going to kill him. As I was pushed toward the gate of his house and a Headlines Today microphone jammed into my face, I thought they were going to kill the two-time Oscar winner. I was standing outside A.R. Rahman’s house at 2 a.m. along with a mob of media persons, musicians, and crazy fans. Drums echoed beats of Jai Ho and the crowd moshed in response as we all waited excitedly for the maestro to return home from L.A. I only have two days left at my internship so the bureau chief had asked me earlier yesterday afternoon if I would be interested being “part of the coverage” of Rahman’s return home to Chennai. I was thrilled and I agreed immediately. Around midnight we set off for Rahman’s house. When I got there the first thing I noticed was that the crowd consisted primarily of men. I walked up closer to where the action was and heard music blaring from the speakers: Jai Ho….over and over again of course. At this point it was just a matter of waiting around until Rahman arrived outside his gate, to be greeted by welcome-home party. His flight wasn’t even supposed to land until 1:15. So we waited…. My hair stuck flat to my head from the sweat and my kurta top was already drenched with moisture. We were all standing one next to the other with no room to move, with the reporters and police officers closest to the gate. 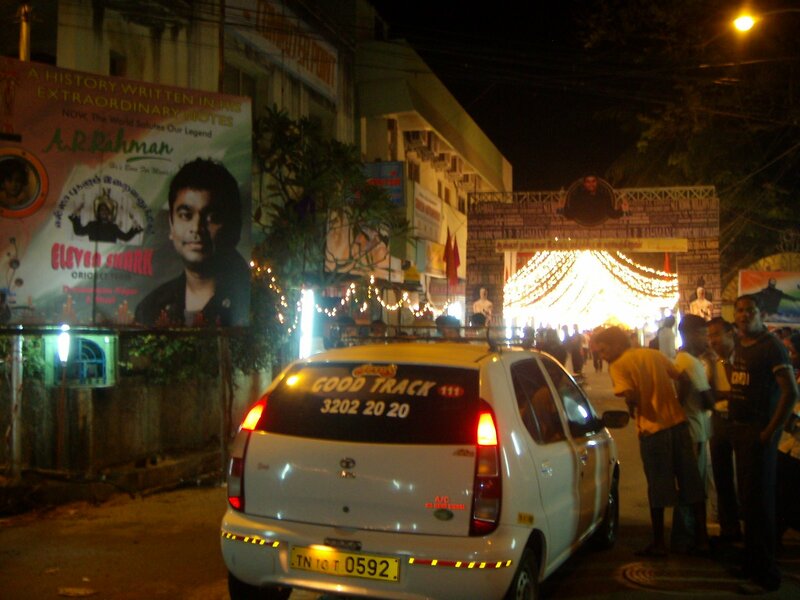 By the sudden surge of excitement–movement, camera flashes and crescendo of music and drum roll, I could tell that Rahman’s SUV must have pulled up. And after that it all turned surreal…. Hands went everywhere. The Headlines Today microphone rammed into my mouth and immediately I tasted salt on my throbbing lip. I was jolted toward and through the gate with such a force that suddenly, I didn’t care anymore about whose hands felt where, but only that I somehow got out of the crowd uninjured, or at the very least, alive. And then my eye caught him. He was wearing a black sports coat–I think–and was being pushed, pushed from all sides with such pressure that I thought he would crumble under the weight of everyone huddling around him. His lips were tightly shut but in a half smile, as if to say, “Well, yep, I guess I’m definitely back in India.” But what struck me is that he wasn’t angry. He didn’t yell back at anyone to stop pushing. He didn’t threaten to have anyone arrested. He didn’t shoo away the one-track-minded reporters who kept snapping away shots and protruding mics in his face. He literally just ploughed through the crowd to the safety of his home, where, still, reporters followed him regardless (including my very own bureau chief). And then all I could think of was how Rahman had just traveled from the other side of the world, two Oscars in hand, and was not even given the chance to just come home and sleep peacefully. For a moment, I actually felt sorry for him. Finally, at around 3:30, Rahman himself braved the throng to step JUST outside his gate to say he was humbled by the warm welcome and that he would still be there for anyone to visit him at another time. With that, he bade everyone good night and told them to please go home. What a guy, I thought. Although he had won two Oscars in L.A., he had come back to Chennai as the same humble Rahman we all know and love. “So, now you got a taste of Indian journalism, eh? Good. Now you know what we deal with all the time,” he said.